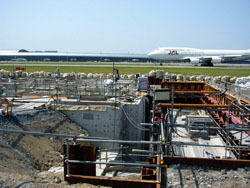 Rain at the Kansai International Airport flows into rainwater drainage pipes at the surface of the facility, and ends up at the sea. Initially, the drainage pipes were installed at an angle so rainwater flowed naturally into the sea. However, the depth of the settlement near the seawall is greater compared to the center of the island. The uneven settlement decreased the angle of the drainage pipes and reduced the natural flow of water to flow into the sea. To solve the problem, KIX began to install drainage pumps at the sea exit points for the smooth flow of rainwater. 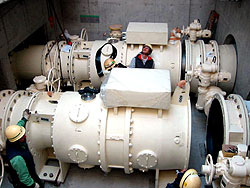 The drainage pumps are equipped to manage extreme rainfall (55mm per hour). The installation of the drainage pumps began in 2001 and was completed in June 2005.